Debian is awesome. 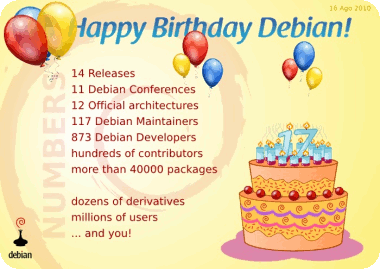 You know that, I know that, we all know that, and 17 years ago Debian entered into our lives. Before I joined the Ubuntu project I was an avid Debian user, and still am. Ubuntu owes a huge amount of thanks to Debian and it’s global family of contributors for all of their incredible work. You can download the latest Debian release from here, and be sure to go and thank Debian here. When I first made the plunge into Free software, I got excited to try Redhat…only I wasn’t in free software to pay for it. I’m a freetard who thinks software, like math, should have no price for everyone. It’s not that I’m cheap, it’s that I know what it’s like to live without privilege, and for billions of people on the planet, $10 is more than they can afford. I wanted free software that was both libre and beer. Then I found Debian. My computing life has never been the same. Thank you Debian developers. You truly make a difference. Debian, you rock my world.